Togo, along with Benin, is the original heart of Voodoo and the religion is still widely practised. 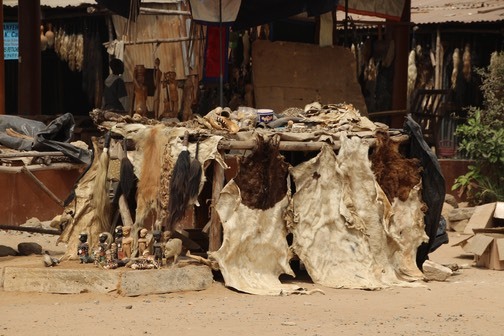 The capital city, Lome, has a fetish market selling animal parts for use in spells/healing. If you have a problem, consult a healer and he will instruct you which animal parts are required for your solution. The market is pretty far out for animal loving westerners, but the claim is that all animal parts are from already dead animals. No collection of live animals apparently. Anyway, judge for yourself. An evening in one village led us to a firedance ceremony, which resembled a corporate team-building event. The power of the mind to walk on coals, etc. 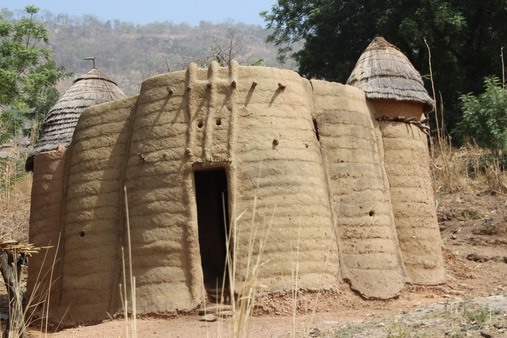 The final visit was to visit a truly astonishing people, called the Tamberma, who construct elaborate castle-like homes to allow them to defend against slave raiding parties in the past. These are constructed to resist horse-riding attackers, with narrow doors forcing a rider to get-off before entering where they can be speared or attacked. Several sets of chambers are defendable making it time consuming and dangerous for the attackers, ultimately leading them to pick on weaker peoples. Sound approach. The bedrooms are on a second layer and are a bit like hobbit chambers with the occupants having to reverse into the chamber.